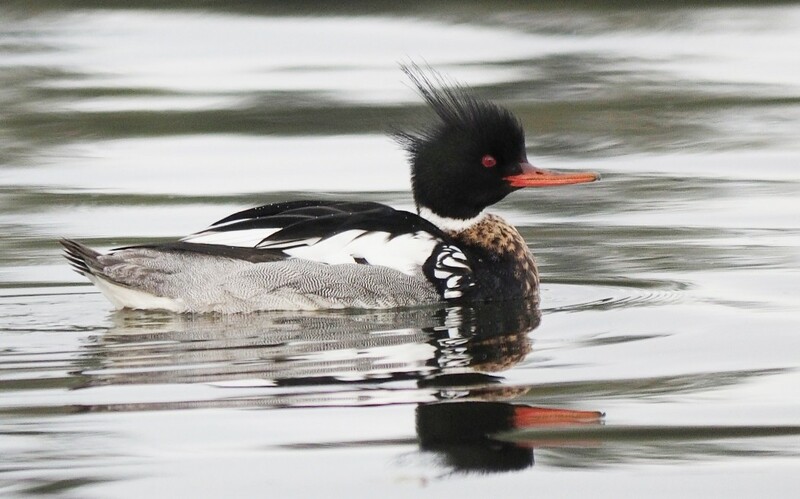 My day was made by finding this red-breasted merganser in my viewfinder on this wet, cold, rainy morning in March. I set out for a walk in the rain to get out of the house, and as usual, my camera went with me. The only time I leave it at home is well… really… never. Maybe if we are going out to dinner on a stormy night, but then again you never know if an owl will show up, but I digress. I grabbed my coat and the camera’s rain jacket (I don’t mind if I get wet as long as the camera doesn’t) and headed out to the water. There were a few ducks around in the bay and the tide was up fairly high. Nothing to write home about, though. The black turnstones were hanging out above the high tide line looking for bugs in the seaweed and I could see some birds offshore. At this time of year, the birds are on the move. They are heading to their breeding grounds and this is the time that we get to see them in all their glorious breeding plumage. I never carry binoculars with me and I don’t have a scope, so what I do in these circumstances is to use my telephoto lens to see what’s out there. Let me state that I have all sort of pictures of birds that look like little specs on the water. 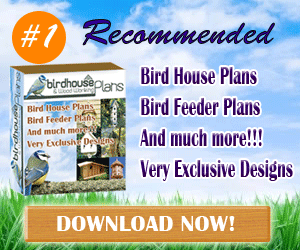 You would need to circle the spec in order to know that it was a bird. But… over the years, I’ve gotten good at IDing them and I can zoom in quite close to see what they are. Not good enough to show you here as they would be so highly cropped, but I could see the following birds. and a song sparrow trying to be a white-crowned sparrow. It almost had the song down, but there was a little hiccup in it. This was actually quite exciting because first of all these are birds we only see in the winter here, except for the sparrow and second because we normally only see them in their drab winter plumage. My wish was that they would come in closer to shore, but there was a lot of boats going and in and out of the bay and the birds stayed offshore. 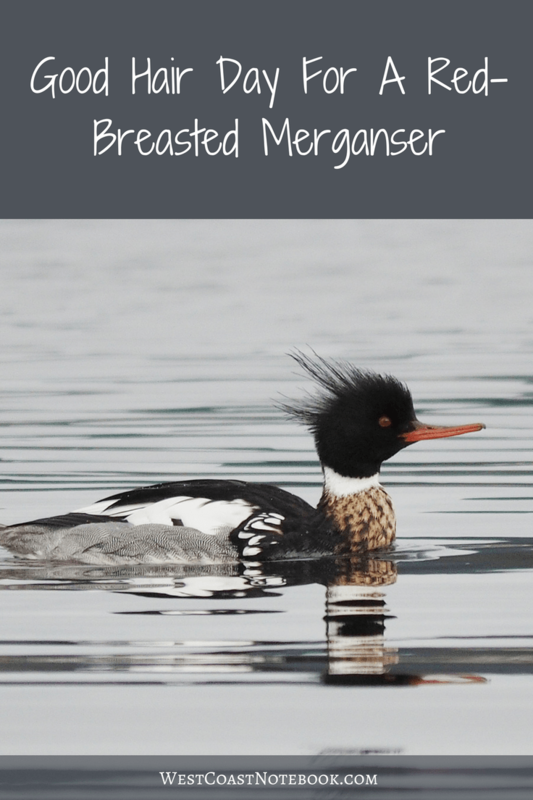 Except for the red-breasted merganser. I came around some large logs and there is was… pretty as you please. It was grooming and preening and just sort of ignored me as I got a little closer to it. It had just stopped raining and the water looked like liquid mercury as I took the picture. His crest looked like he had just combed it with a hair pick and his normal iridescent greenish black head looked black. Most often you see them with their crest down next to the crown of their head so they have a smooth line instead of the crest. 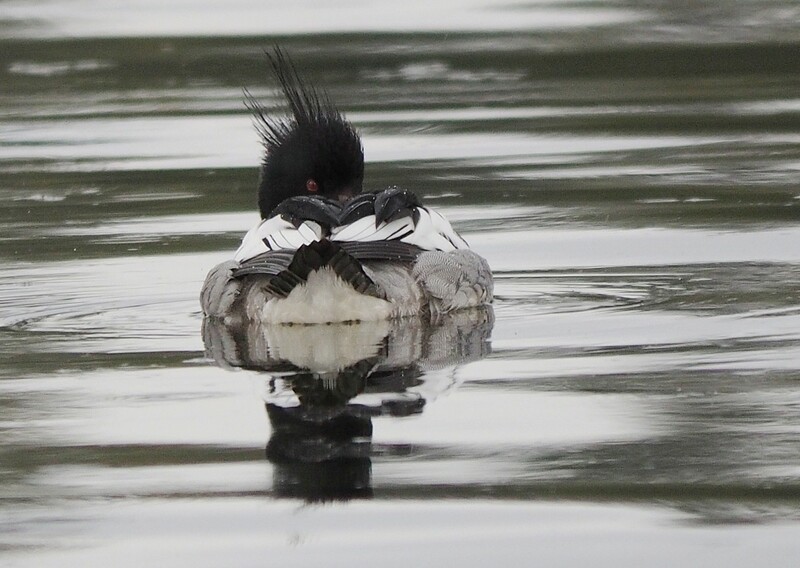 As I sat on a wet log he continued to groom for a while and then drifted off to sleep, opening one eye occasionally to see what was going on around him. I watched in for about 10 minutes until a dog came along and started barking at it. It took off in a flash and I missed the shot as I wasn’t ready.